Tonya Gilles Koch is the first thing you see when watching the movie, "A League Of Their Own." She is the one pitching! And, pitch she could. She was named to the ASA girl's all-state team as a 15 year-old and pitched Bergan High School to a conference title the following season. That summer she joined the Pekin Lettes and went 18-5 to break Lori Ramsey's rookie record. 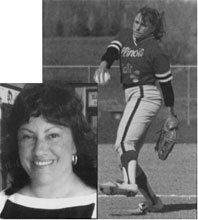 Tonya took her game, first to ICC where she was a JUCO All-American and then to ISU and led them to a 9th place finish in the 1981 NCAA College World Series. She had the good fortune to be coached by two of softball's greats - Ramsey and Margie Wright. She learned her craft well. Since brief coaching stints at Illinois Central College and Bradley University, Tonya has privately tutored softball pitchers. Two of her charges attained greatness. Melissa Cassidy and Nicol Kurth went on to capture the 1998 Junior College National title for ICC. Cassidy was the tourney's MVP. In all, some 55 of her students have received full athletic scholarships to Division I college programs. Harry Anderson has been close to the baseball scene since 1935 when he was named the most valuable player of the Chicago area American Legion program. In the Brooklyn Dodger farm system after World War II, he was on the coaching staff at Pekin by the late 1940's, and in 1950 was a catcher in the Sunday Morning League. He was manager of the State Farm Insurance team in the National Fastball League and was head baseball coach and football line coach at Pekin High School and was to eventually serve as Pekin's head basketball coach. 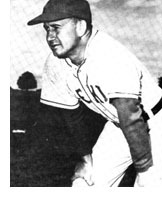 After winning the state baseball title in 1951, he took his next two teams back to the state tournament and eventually coached Pekin to 26 baseball championships in 17 years with a career record of 232-175. After retiring from high school coaching and teaching, he coached the Illinois Central College baseball team for three seasons. Anderson, for many years a major league scout and a veteran basketball official, is a member of three Halls of Fame - the IHSA state baseball tournament, the Illinois High School Baseball Coaches Association and the Illinois Basketball Coaches Association.